Billed as 'better than the iPhone'... but can it even compete? 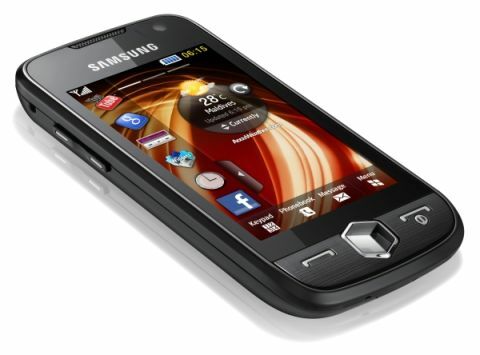 The Samsung Jet S8000 - is it a budget alternative to the iPhone? A dinky effort that feels a little underpowered thanks to the TouchWiz interface but has a decent feature set and sits well in the hand. Samsung's latest flagship handset, the Samsung Jet S8000, was released to massive fanfare around the world, and the General Manager for the UK said that he thought it was better than the Apple iPhone 3GS - but can a non-smartphone really compete? The Samsung Jet S8000 is billed as 'Smarter than Smartphone', a direct comment on the fact that while it uses Samsung's proprietary feature-phone UI, the TouchWiz 2.0 OS, it still packs some mean hardware under the hood. And we're not just being complimentary of the specs by saying that, we're talking an industry-leading 800MHz processor powering the performance from a dinky frame (108.9 x 53.5 x 11.9mm) on a 3.1-inch AMOLED screen. While it's hard to see where this might rival the iPhone in the mobile phone market, bar having a touchscreen, it's certainly cheaper than most of its smartphone rivals, with users getting a free phone and paying less on their contract and up to £150 less to pick up the handset SIM free. The first thing that hits you when you pick up the Samsung Jet S8000 is just how small it is. While the dimensions will give you an idea just how dinky it is, it's very hard to describe just how diminutive this feels in the hand. This is a double-edged sword for the phone: on the one hand, the Samsung Jet S8000 fits very well in the pocket and is a real pleasure to carry around compared to some of the other chunka-phones on offer. However, on the other hand, the plastic chassis and the 110g weight count against it, as it feels a little lightweight and, dare we say it, cheap in the hand. We like the shiny red prismatic effect on the back of the phone though, and the AMOLED screen just screams colour no matter what you're displaying on the screen, but there's something about the build quality that doesn't shout 'we've spent £5 million on a global marketing campaign for this handset'. We're not saying the plastic-feel of the Samsung Jet S8000 is a bad thing, as it's certainly very pocket friendly which is obviously very important for a number of people these days. It's just that a little bit of brushed aluminium or stronger materials would have probably added to the overall appeal and feel of the phone. That said, the phone is well designed and all the buttons are within easy reach thanks to the smaller proportions. We're utterly delighted to see another 3.5mm headphone jack stuck on the top, and Samsung has managed to do this without adding a huge amount of depth to the device. However, when using headphones plugged into the Jet S8000 it's very difficult to use the full QWERTY keyboard in landscape mode and watching video is a little tricky too, as the jack is a little too far to the left in our opinion. Actually, this is something Samsung does very well (packaging things all together in a compact handset) and makes us wonder why a company like HTC keeps maintaining it can't do a headphone socket and a flash. But we think you'll find that with the Jet S8000 Samsung has managed to do all the above AND improve the camera to a dual flash version... this shows there's room for improvement, HTC (although well done for putting a 3.5mm jack on the Hero). The Jet S8000 is one of the first Samsung phones to make use of the Cubic-style menu interaction (more on that later) and in honour of this, it has placed a 3D-cube style button on the front which carries the same sort of functionality as the menu button on S60 devices. It's a little large and garish for our tastes, but at least it brings some unique style to the front of the phone and, let's be honest, this is a phone Samsung hopes people will pick up for the way it looks, as much as the hardware.The likes of 2GB of internal storage and 30fps VGA video camera will act like gadget sirens (the ones from Greek mythology, not on top of police cars). It's an interesting idea to place the button that calls up the spinning cube next to the camera button, but one that works surprisingly well, with very little confusion as we might have predicted before trying it. It's got a slightly similar footprint to the Palm Pre in being deceptively small, which means it fit snugly in the hand rather than dominating it in the style of the iPhone 3GS, although it would have been nice to feel a little more weight or strength in the chassis.